" Zero apneas the first night. Normally I have 3-5 per night. Easy to program. Seems to be a great machine. It is my 4th machine. " " Wow! I replaced a ten year old machine with this one. It is so quiet that I can't even tell when it is running. " 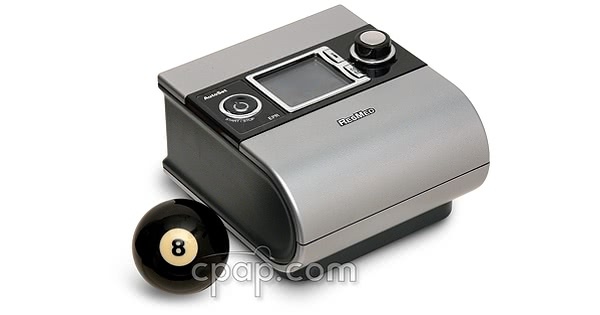 Humidifier Included: Please note that the price listed includes the H5i heated humidifier. The S9 AutoSet is the premium Automatic Positive Airway Pressure (APAP) model in ResMed's S9 Series. ResMed had incorporated Easy-Breathe Technology along with an Enhanced AutoSet algorithm to make breathing through a CPAP feel more "natural". Major improvements can be seen throughout the system with advanced features like the H5i with Climate Control, OPTIONAL ClimateLine heated tubing, and on-display advanced data reporting. The Enhanced AutoSet Advantage now detects and responds to open events using an event responsive Forced Oscillation Technique (FOT). A different event response is generated when an open airway event is encountered. 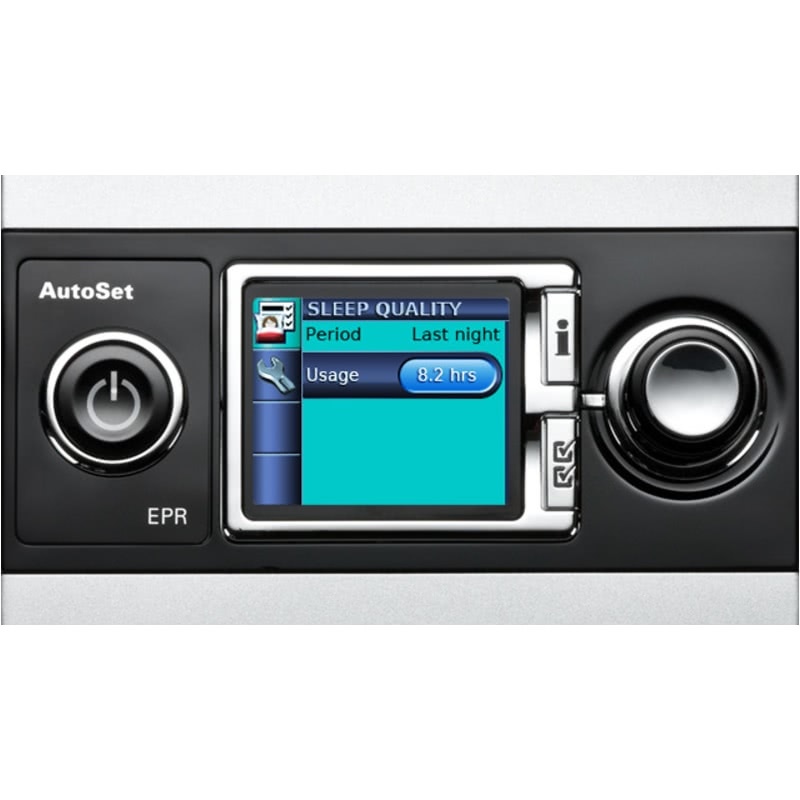 The AutoSet algorithm measures flow limitations such as snoring and apneas on a breath-by-breath basis. Therapy begins at a minimal pressure. When the user's airflow shows signs of flow limitation, the AutoSet algorithm gently increases pressure based on the intensity and duration of the event. Once the event clears, pressures gradually decrease over a 20 minute time frame. Flow limitation occurs as the upper airway begins to collapse, before snoring and apneas are detected. By gradually increasing therapy pressure, the AutoSet algorithm reacts preemptively, resulting in lower average treatment pressures. For example, as you sleep on your side, pressures will stay at a minimum because your airway is open. Turning on your back can collapse the airway and the AutoSet algorithm will increase the pressure. The AutoSet algorithm recognizes other conditions like sinus colds or allergies, which restrict nasal airflow. The AutoSet Advantage will increase treatment pressure accordingly, for whatever flow limitation may occur. 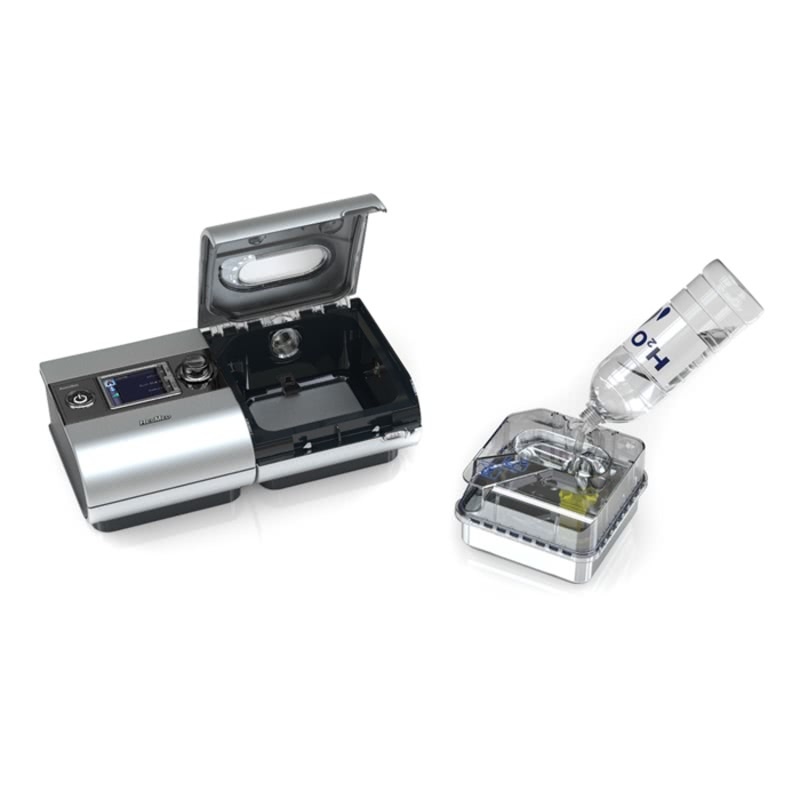 The S9 AutoSet uses Easy-Breathe Technology along with expiratory pressure relief (EPR) to make breathing through an APAP feel natural. At the onset of a flow limitation, the AutoSet algorithm responds with an increase of therapy pressure based on the degree of airflow restriction. Easy-Breathe technology aids in smoothing the pressure waveform during pressure increase. 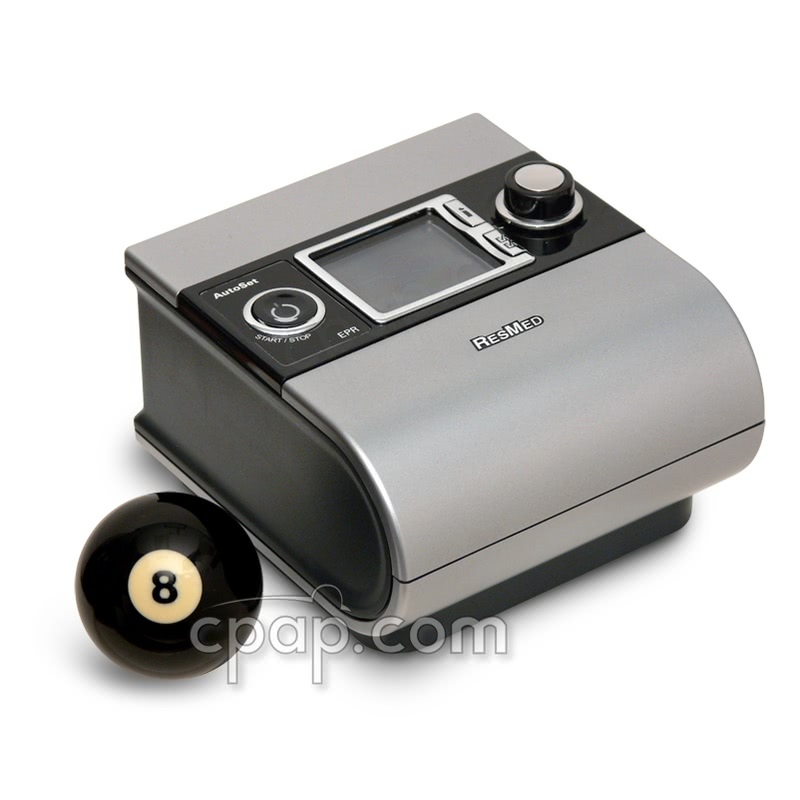 The process imitates normal respiration and ultimately makes breathing more comfortable than traditional CPAP machines. Easy-Breathe allows the user to receive the lowest pressure necessary to keep the airway open. As an added benefit, Easy-Breathe allows the S9 Series to operate at 26 dBA when set to 10cm of pressure from a distance of one meter. ResMed also managed to reduce the overall conducted noise that typically travels from the machine, through the tubing, and at the mask. EPR decreases the pressure at the beginning of each breath and keeps the pressure low throughout the exhalation. The pressure is reduced by an exact pressure drop of one, two or three centimeters of water pressure. EPR gradually changes therapy pressures so there is little ventilatory effect. EPR also has an Event Detection Circuit. When a sleep disordered breathing event is expected or has occurred, EPR stops until the event concludes and normal breathing resumes. SmartStart / SmartStop enables your device to start automatically by breathing into the mask. This feature automatically starts and stops your CPAP machine when you put on or take off your mask. 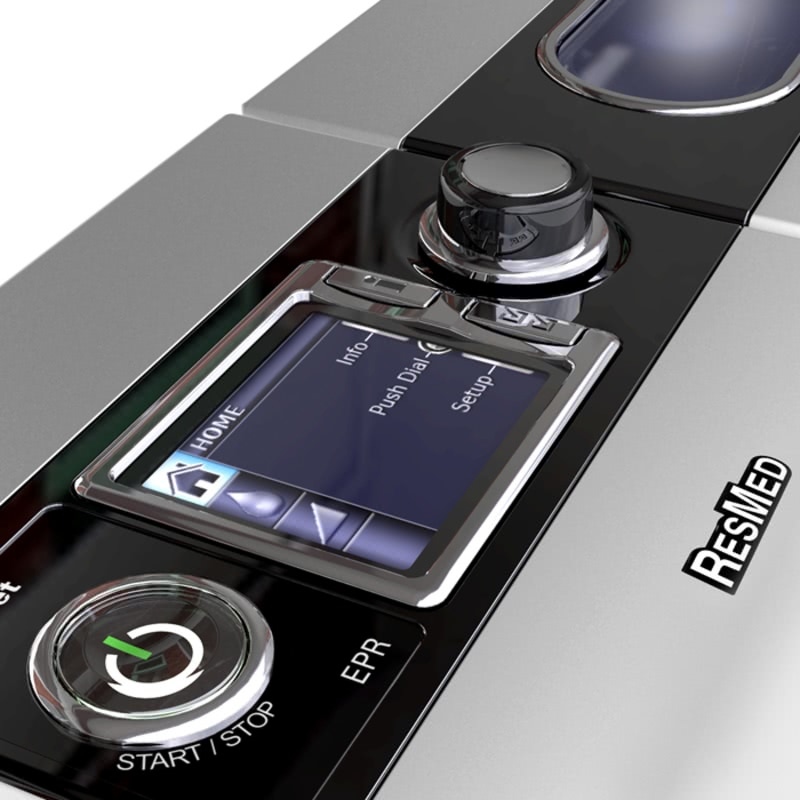 ResMed offers a "For Her" version of this machine. Click here to view the pink S9 AutoSet for Her CPAP Machine and H5i Heated Humidifier. View our CPAP Newsletter CPAP Newsletter: Understanding the S9 Line to see a detailed comparison of S9 Machines. DC Power: Only use DC Converter by ResMed for DC input or damage may occur. 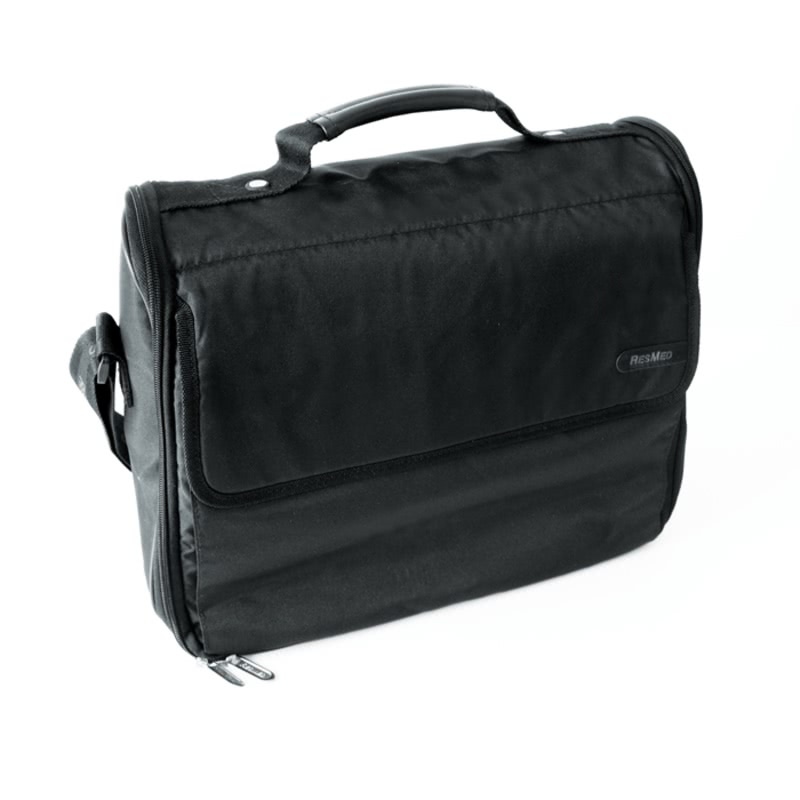 These S9 devices comply with US FFC Part 15, Class B requirements if no external data cables are used. To see a detailed comparison of the different S9 CPAP machines by features, please see our CPAP Newsletter: Understanding the S9 Line. The S9 Series can use (2) different Power Supply units, a 30 Watt or 90 Watt external brick. 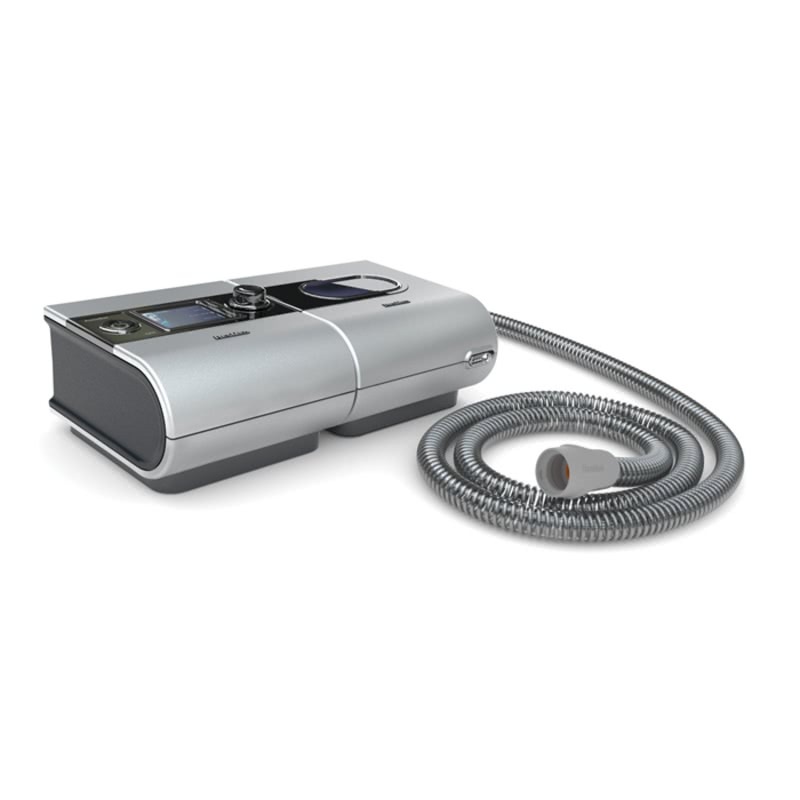 S9 machines come standard with a 90 Watt Power Supply that can power the CPAP machine and Humidifier. The 30 Watt Power Supply will only operate the CPAP machine and the humidifier will act as a passover. The S9 Series now can use the ResMed hypoallergenic air filter. The filter is made from non-woven acrylic and polypropylene fibers with a polypropylene carrier. For help understanding how AutoSet with Easy-Breathe works, click on AutoSet with Easy-Breathe Tech Fact Sheet. For help with setting up the S9 Series, click on the S9 Elite and AutoSet Welcome Guide. 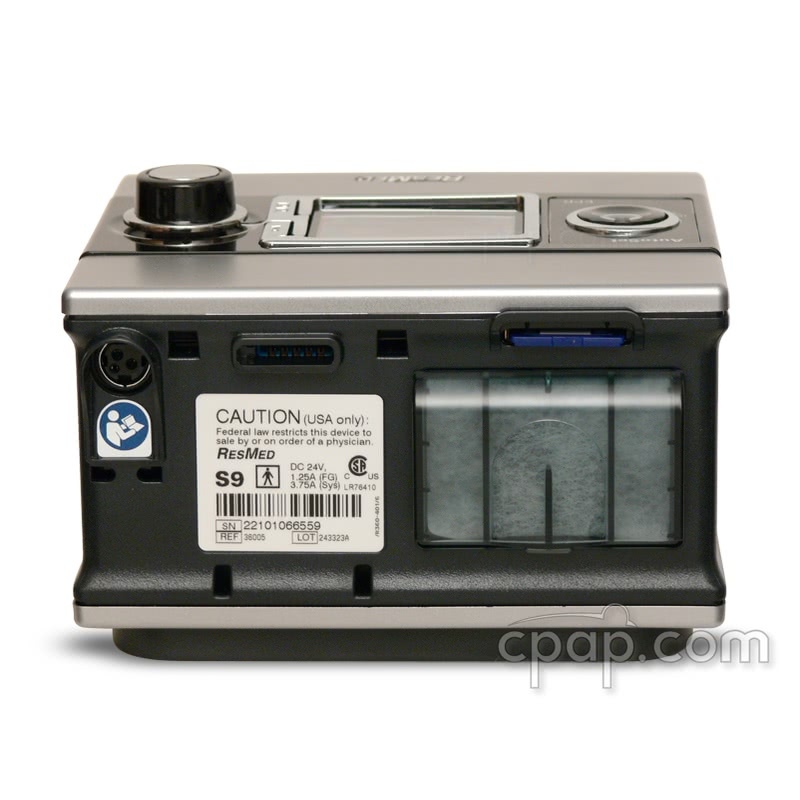 All S9 Series machines utilize a "Cool Down" feature that runs the CPAP Motor up to 1 hour after turning the machine off. The motor helps to cool off the humidifier plate. You may hear a "faint blowing sound" when you turn the machine off. However, you can unplug the power cord and allow the heater plate to cool without airflow. Tubing Options: ResMed's S9 AutoSet CPAP has a number of tubing options. The SlimLine 15mm tube is a non-heated tube in a thin, flexible style. The machine can also be used with an OPTIONAL heated ClimateLine Tubing which integrates with the machine and OPTIONAL H5i Heated Humidifier to provide increased humidification and reduced chances of rainout. The ClimateLine is available in two diameters. 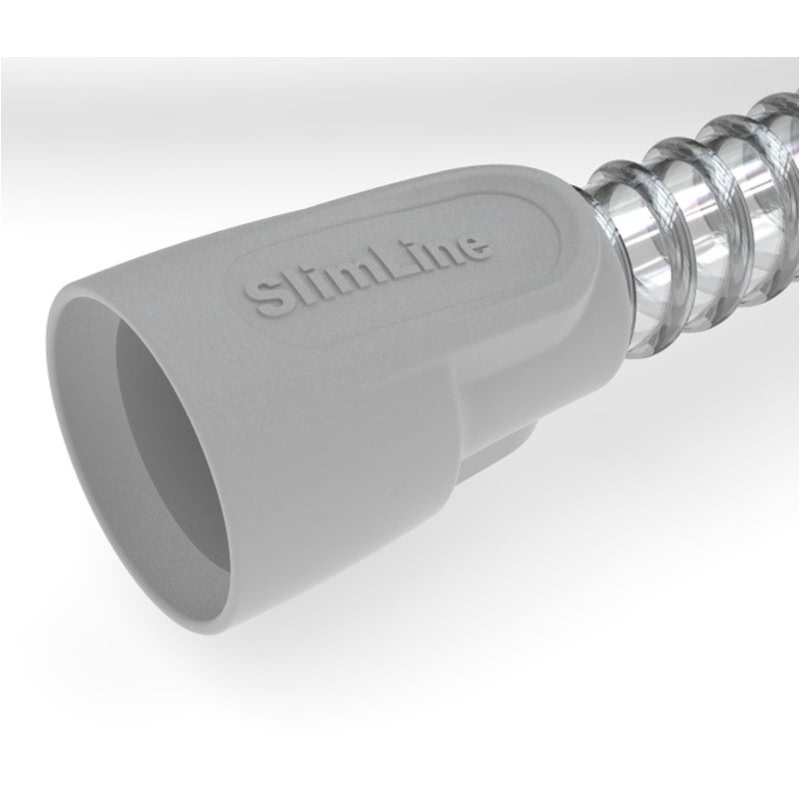 The SlimLine 15mm ClimateLine Tubing and a standard diameter 19mm ClimateLine Max Tubing. Additionally a standard diameter, non-heated tube may be used. 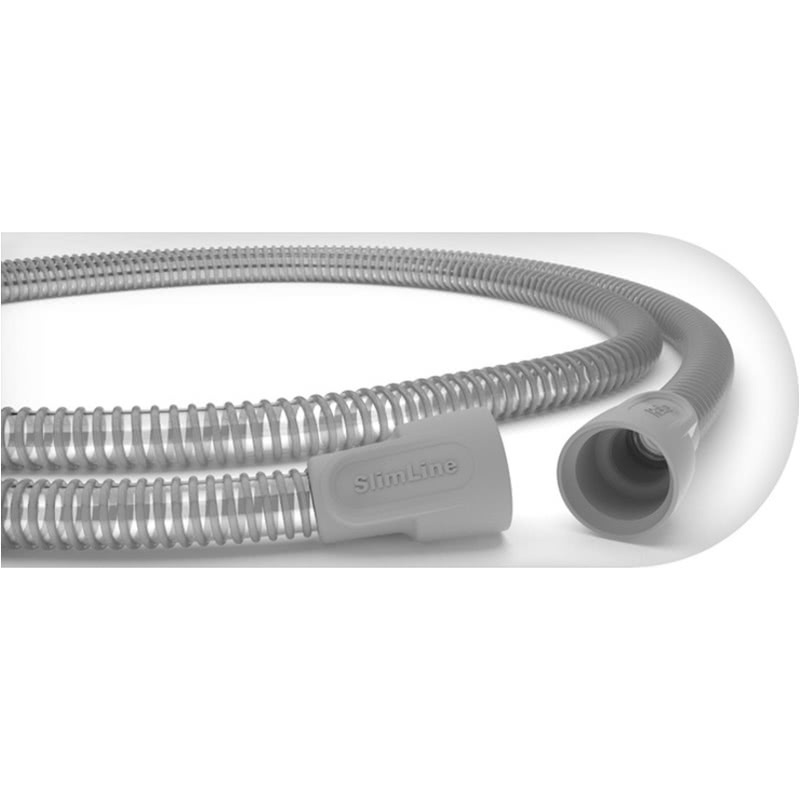 Please Note: If an O2 Enrichment Adapter is used with the ClimateLine Heated Tubing for the S9 Series of CPAP machines, the O2 Enrichment Adapter must be placed between the ClimateLine tubing and the mask instead of between the S9 Humidifier and the hose, in order for the ClimateLine tubing to work correctly. The following information is applicable for the ResMed S9 AutoSet alone or with a heated humidifier. Keep in mind that using a heated humidifier will reduce the run time of the battery by approximately one half. DC capable: Use the DC Converter 24V 90W For S9™ Machines to operate the S9 AutoSet from a DC power source (battery). 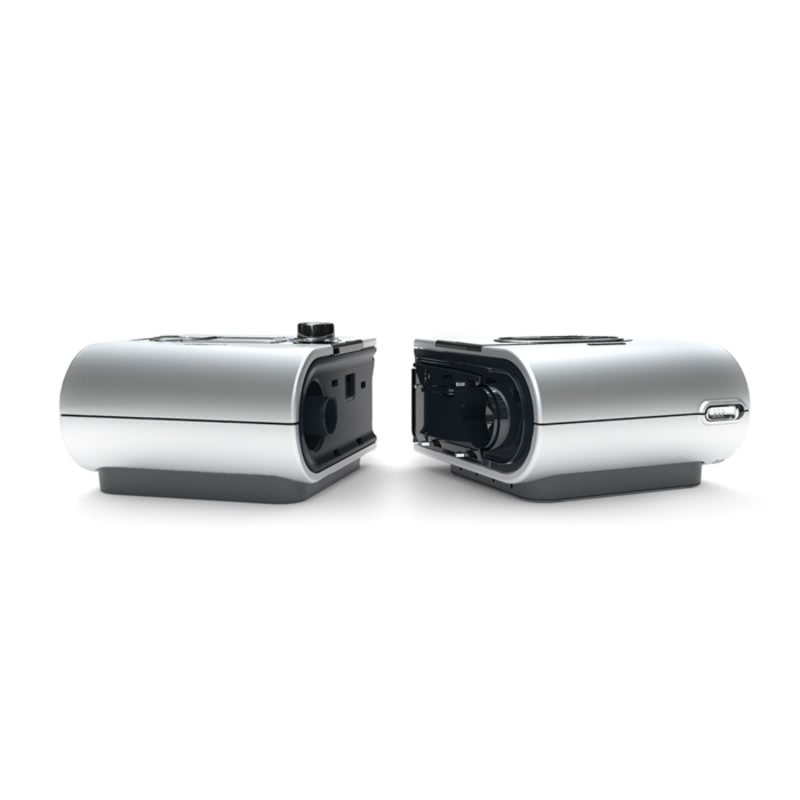 Freedom Travel Battery Pack for CPAP Machines: Use the 24V Converter for Freedom Battery to connect to the Freedom. The Freedom is a lightweight lithium ion battery. The S9 can also be powered by Deep Cycle Auto and Marine Batteries. These batteries are typically found in auto parts stores locally. CPAP.com does not sell Deep Cycle Auto and Marine Batteries.